This beautiful square is an absolute must this winter. Designed by Sandra Kuijer, Elements Cal started in December 2017 and has been a hit ever since then. There are lots of possible creations you can make – blankets, centrepieces, and pillows are most obvious. Here, we would like show you to the most beautiful hue combinations, but the number of variants is essentially limitless. Let your imagination run wild. Link to the free pattern is at the end of article. UPDATE – now you can also see 10 Parts of the Video Tutorial where you can find detailed instructions how to crochet this unique pattern. Link to video tutorials are at the end of article. Elements Cal Square – Free Crochet Pattern is >>>here. <<< You can also see it on Ravelry. 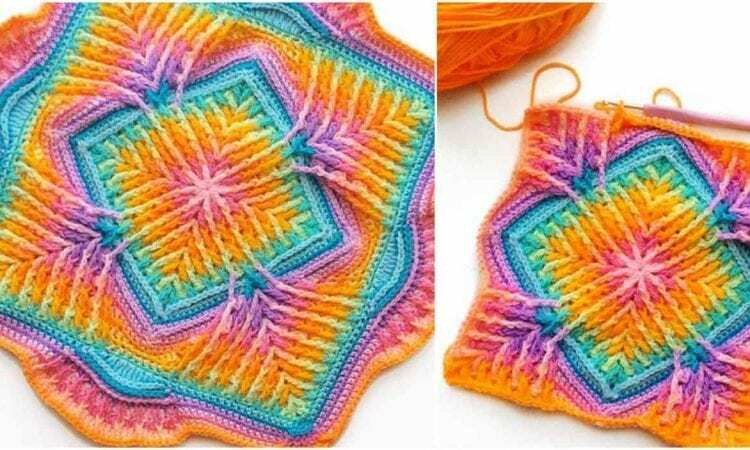 If you would like to watch Video Tutorials how to crochet Elements Cal Square go to Part 2 – Video Tutorials >>>here. <<< Don’t forget to Like us on Facebook. Share your ideas and your work on our Facebook group! it would have been Nice to have known this post. Thank you! It was our pleasure. Sandra Kuijer’s Elements Cal Square is one of the most beautiful patterns we have ever seen. I love this pattern. I can see peace in your pattern. It is Beautiful. The colors are calmly flowing. HI, I LOVE THE BLANKET YOU MADE BUT I CANT SEAM TO GET THE PATTERN I WONDER IF Y, HERE IS ME E M AIL IF YU CAN SEND THE PATTERN THERE THAT WILL BE GREAT, BECAUSE KNOW QERE IT SAYS TO SHARE TO GACEBOOK, SO THIS IS MY E MAIL, YOU CAN HELP ME AS TO WHY, [email protected] ALL SMALL LETTER,S, AND I LOVE MORE PATTERNS YOU HAVE, AM I GOING TO HAVE THE SAME PROBLEM,THAT I CANT SHARE THEM TO MY TIMELINE, OR GET THE PATTERN,S ??????? I have tried to get the pattern thru the link and Ravelry. I get the same thing. Pictures of squares with prices under them. No free pattern. Can’t download it. It is fustrating with sites like these. A link is correct, please scroll the page you have seen – a pattern is divided on a few parts, link to each part is under the photo (down the page with the squares with prices). I found where to download this pattern but I can’t find weeks 1 and 2 . Mine starts with week 3 and round 24. I absolute love this pattern in the blues and so want to know how to start. On first site bottom it says ” click here to read article to the end” click it. Next site on the bottom ar the week 1, week2 files you can download. It would be very nice if this pattern or patterns were written in English and easy to find at the end of the pictures. Instead of it saying that at end of article the FREE PATTERN is a click away but that only takes you somewhere else that has nothing to do with the original pattern. Why make it so hard to get?? It’s beautiful handiwork and I would love to make a bedspread but no pattern is available. Why even bother to print the designs if not available?? The patterns and supply list all have an English and a Dutch version to download. I had no problem at all downloading. The FB page is also very helpful with beautiful photos of others’ creations. i cant find the link either. there are several links, they all go to other stuff. it is a beautiful work, would love to attempt. Link to the pattern is at the end of the post, but please first find the sentence “Click here to read article to the end’. Looking for the pattern for the element cus square but was not able to find it. Could you help! I cannot get the pattern. Copying the link doesn’t work. I would really like to have a printed copy of the instructions. Can someone help me please ? What do you mean “down of the site”? Link to the pattern is always at the end of the post. Can you please specify which one? This is absolutely stunning ???? Thank you for sharing your beautiful pattern. I saw this on Pinterest and fell in love with the gorgeous lay out, very eye popping. Can you tell me tho how we will know when you get to round 9 and so on. Thanks again!! such a beautiful piece! I sure wish I could crochet as beautifully as you do, but i’m a really long way from that. Thank you for sharing. Yarn recommendations would be helpful and greatly appreciated – I’m not an experienced crocheter (yet). This pattern is on my bucket list. Thank you. It’s beautiful. Having my first great grand child next August. I should start right away. I still need instructions for rows after 9. Muchas gracias por compartir algo tan nuevo y bonito. Oh, those were so beautiful I hope that I will be able to make them to look as nice as yours. Hi. Week 10 is not complete in the English version. It is missing the first and last pages. It’s a beautiful pattern. Thank you for making it available. For those of you having a hard time getting a copy of the pattern, you have to download all 10 weeks and the supply list. It is a total of approx. 72 pages, with pictures. Cal Sq pattern would be nice if the link was there. At the end – I know. But all is does is send you back around in a circle. NO PATTERN. Would love to make. I just love this pattern, and I would like to make it. On the purple pattern, how many skeins of each color do I need? There is no link at the bottom of the article for the “ Elements Cal Square”. I would love to try this. Can you send me the link or the PDF? Link to the pattern is always at the end of the article. Please read to the end. I didn’t see the link at first either. On my kindle there was a “+” read more of the article, link and I found the links when I finally found the end of the article. ???? Good luck to those looking and thank you for the wonderful pattern. It says I have downloaded, but I can’t find anything. I know, I know at the bottom of the end of the post. But, as everyone else has said, IT IS NOT THERE. How do we get this? Or even get into what is downloaded. Can’t find it anywhere. Please find ‘Click here to read article to the end’, it starts with ‘+’ and follow the tekst to the end. Ссылка на шаблон находится в конце статьи, спасибо. I read the article to the end and clicked on the link. It took me to a page that was not in English and looked like there was a charge for this “free” pattern. Can u send me a link(in English) for this pattern please? Yes, the page is in Dutch, but pattern is in Dutch and English. In the Article at the end where it says “Link to the pattern “HERE”” – click that. The complete pattern weeks are available to download in Dutch and English. There are also step by step videos on YouTube in English, just use the search function on YouTube and type in Elements CAL. It is not hard to find. I’m almost finished with mine and absolutely love it! The link to the pattern is at the end of the article. Nevermind!! LOL I figured it out Finally!! 🙂 Thank you!! The link to the pattern is at the end of the article. You will probably didn’t read it to the end. There is a sentence ‘click here to read article to the end’. I really wish that there was colors and brands, etc posted with the inspiring examples you’ve pictured…. i’d love to try to re-create the Grey/Burgundy &the Blue/White colorations in some way! I love your purple, black combo cAli pAttern it fascinates me ! I would like to give it a try . I’m not good at gettting pattern off load . Am I the only one not seeing a link at the end of the article? :(. And what is the name of the Facebook group? Interested in knowing the colors used in the sample photographed by LittleStories. Love the pattern. Practiced with scrap yarn but like those colors for Christmas. Thanks! Great post! However, I would’ve liked you to ask permission before you used my picture for it ???? The least you could’ve done was to link to my Instagram like you have linked to other people’s pages ???? Hi Eva, I’m very sorry! When this post was created, it was impossible to find a sources of few photos. Please give us a link you like us to put under the photo and we will. I’m sorry, I thought you were an author of different photo. I think I know which one is yours, please have a look. Can we keep your photo? Would you like us to link to Instagram or to your webpage? Thank you for sharing all the parts to your CAL & I look forward to following them. For those who are unable to find the links, you need to read to the end of the review. You will see the rest of the article, and the link is at the end. There's also a link to the Ravelry & Facebook pages. Thank you, just saw this after sending my comment that I could not find it. Link to the pattern is at the end of the post. Sorry, we can not email it to you. Link to the pattern is at the end of the post. So you keep saying – I still cannot find it !! Thank you for linking to my Instagram but the link is broken. Would you mind fixing it? ???? Hi, I’m so sorry, I was probably logged to Instagram. Could you please check it now? the pattern isn’t available at the end. You are a talented person! I am trying to find the free written pattern for this because a friend wants to try it. At one point toward the top of this page, you say that the link to the free pattern is at the end…..no it is not. It takes me to a page from Amsterdam (I think) and every single one of the four pattern choices for this that they show has an amount in Euros underneath it. The link for seeing the free pattern on Ravelry even takes me tot hat same Amsterdam website. If you do not want to give the written pattern, please do not give links where the written pattern is not free. Ani, please just scroll dawn the ‘Amsterdam’ page – pattern is dawn the page under the four yarn pattern choices and it’s divided into 12 parts (weeks). I love this afghan pattern. Can’t wait to make it.